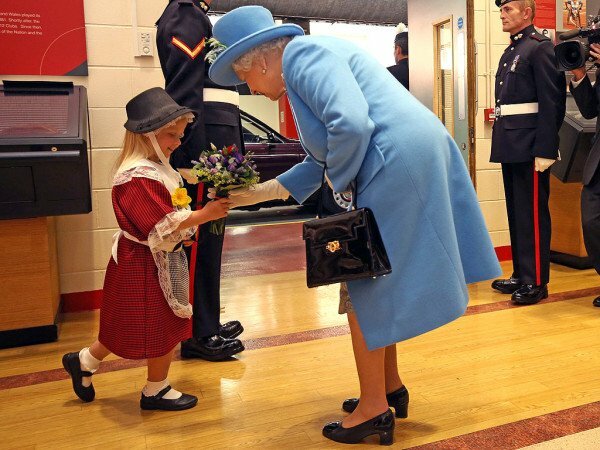 A six-year-old girl named Maisie Gregory was hit in the face by a saluting soldier after she met Queen Elizabeth II in Cardiff. The Queen was presented with a posy by Maisie as part of a regimental tradition. Dressed in a traditional Welsh costume, and giving an adorably wobbly curtsy, Maisie Gregory performed her bouquet-giving duties to perfection. But she had reckoned without the private standing next to her. As the Queen walked out of the Millennium Stadium, a uniformed army private raised his gloved hand enthusiastically to salute the monarch, and caught Maisie in the face. The accident happened as the Queen honored The Royal Welsh with new colors during a ceremony at the Millennium Stadium. Maisie’s father, Regimental Sergeant Major Martin Gregory, said his daughter has since seen the funny side.